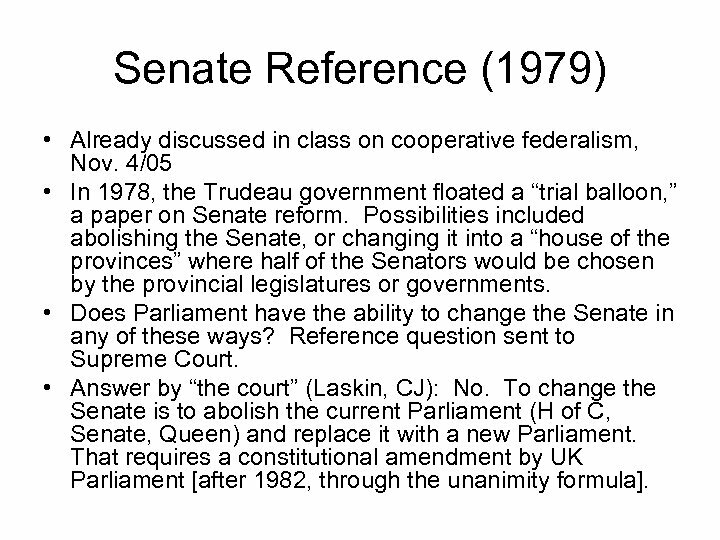 Senate Reference (1979) • Already discussed in class on cooperative federalism, Nov. 4/05 • In 1978, the Trudeau government floated a “trial balloon, ” a paper on Senate reform. Possibilities included abolishing the Senate, or changing it into a “house of the provinces” where half of the Senators would be chosen by the provincial legislatures or governments. • Does Parliament have the ability to change the Senate in any of these ways? Reference question sent to Supreme Court. • Answer by “the court” (Laskin, CJ): No. To change the Senate is to abolish the current Parliament (H of C, Senate, Queen) and replace it with a new Parliament. That requires a constitutional amendment by UK Parliament [after 1982, through the unanimity formula]. 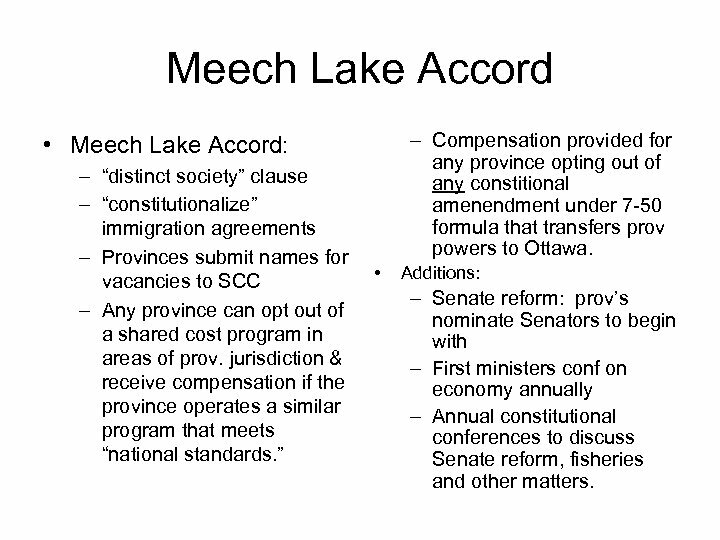 Meech Lake Accord – Compensation provided for any province opting out of any constitional amenendment under 7 -50 formula that transfers prov powers to Ottawa. 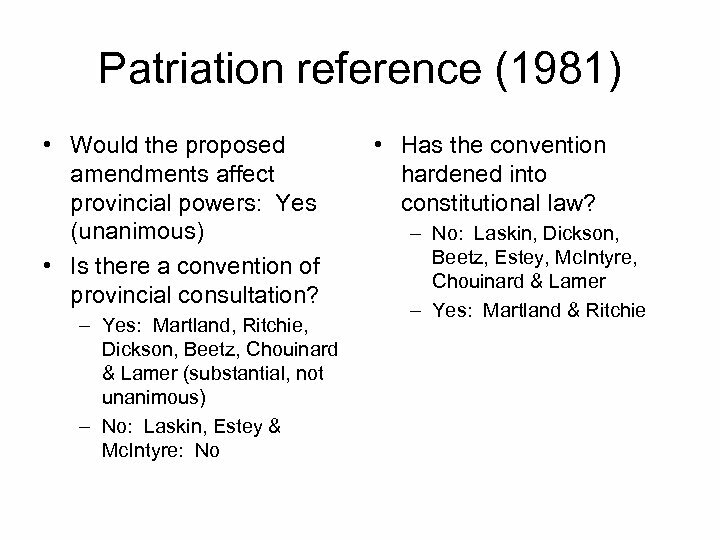 • Meech Lake Accord: – “distinct society” clause – “constitutionalize” immigration agreements – Provinces submit names for vacancies to SCC – Any province can opt out of a shared cost program in areas of prov. 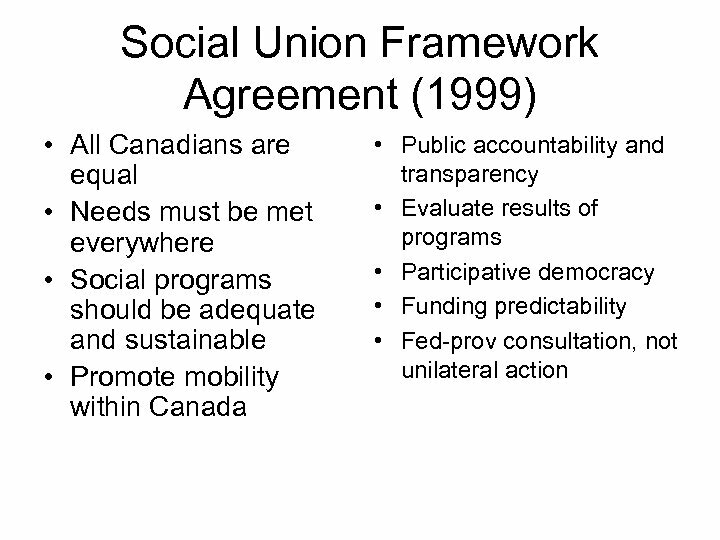 jurisdiction & receive compensation if the province operates a similar program that meets “national standards. 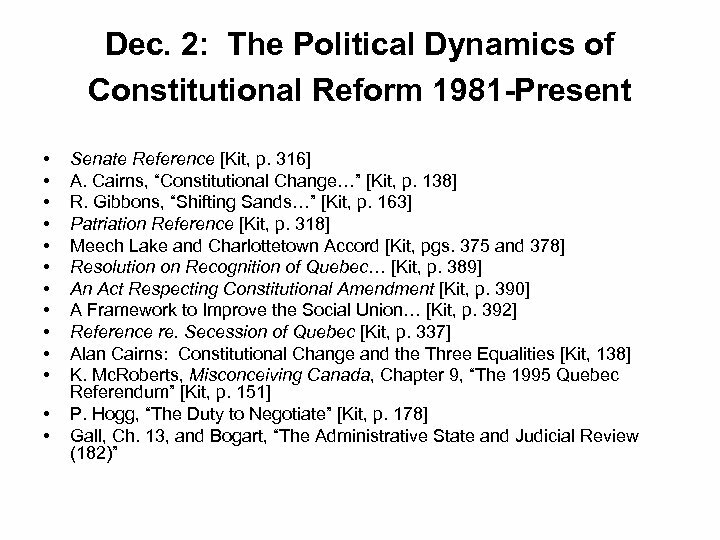 ” • Additions: – Senate reform: prov’s nominate Senators to begin with – First ministers conf on economy annually – Annual constitutional conferences to discuss Senate reform, fisheries and other matters. 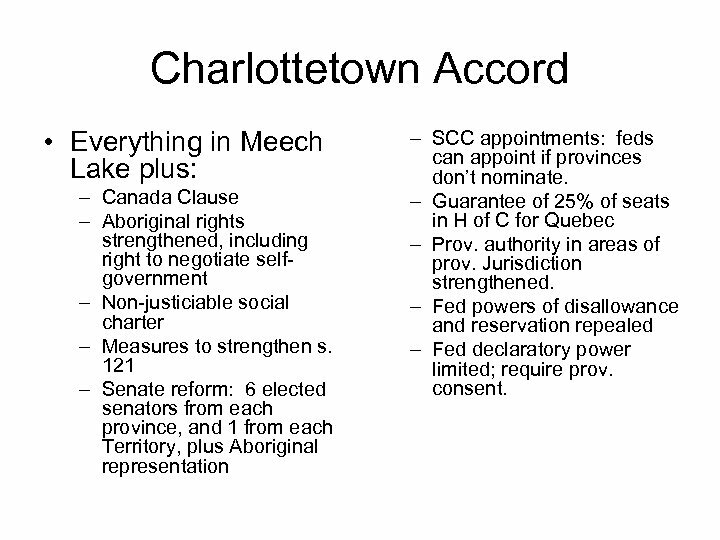 Charlottetown Accord • Everything in Meech Lake plus: – Canada Clause – Aboriginal rights strengthened, including right to negotiate selfgovernment – Non-justiciable social charter – Measures to strengthen s. 121 – Senate reform: 6 elected senators from each province, and 1 from each Territory, plus Aboriginal representation – SCC appointments: feds can appoint if provinces don’t nominate. – Guarantee of 25% of seats in H of C for Quebec – Prov. authority in areas of prov. Jurisdiction strengthened. – Fed powers of disallowance and reservation repealed – Fed declaratory power limited; require prov. consent. 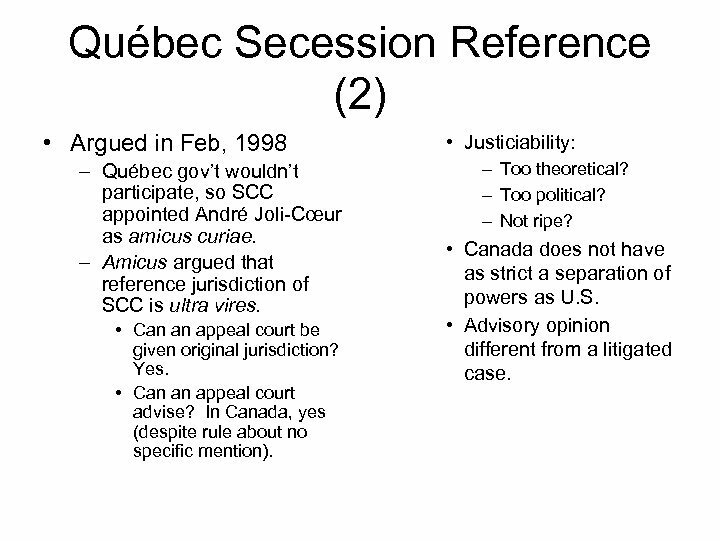 Québec Secession Reference (2) • Argued in Feb, 1998 – Québec gov’t wouldn’t participate, so SCC appointed André Joli-Cœur as amicus curiae. – Amicus argued that reference jurisdiction of SCC is ultra vires. • Can an appeal court be given original jurisdiction? Yes. • Can an appeal court advise? In Canada, yes (despite rule about no specific mention). • Justiciability: – Too theoretical? – Too political? – Not ripe? 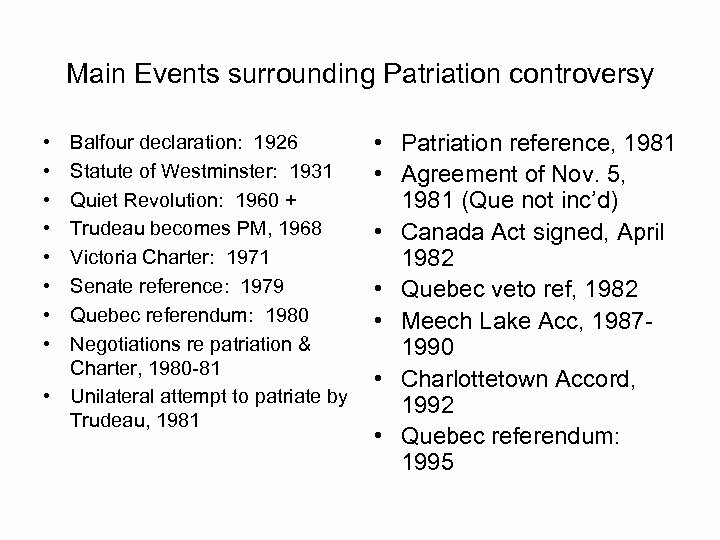 • Canada does not have as strict a separation of powers as U. S. • Advisory opinion different from a litigated case. 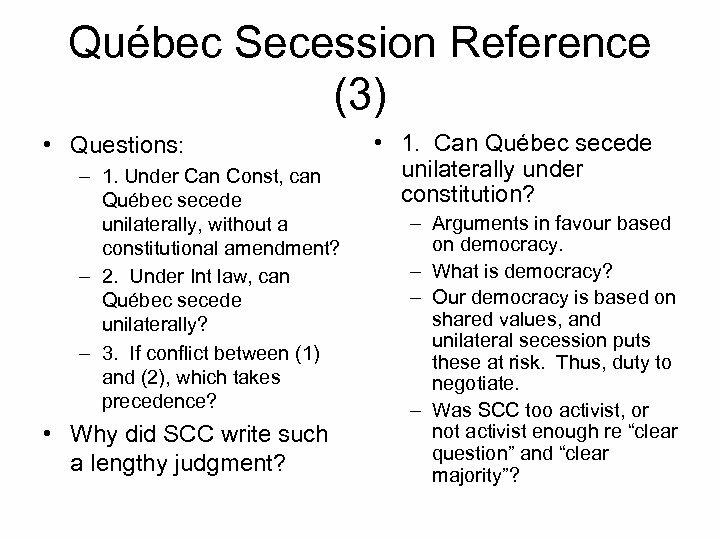 Québec Secession Reference (3) • Questions: – 1. 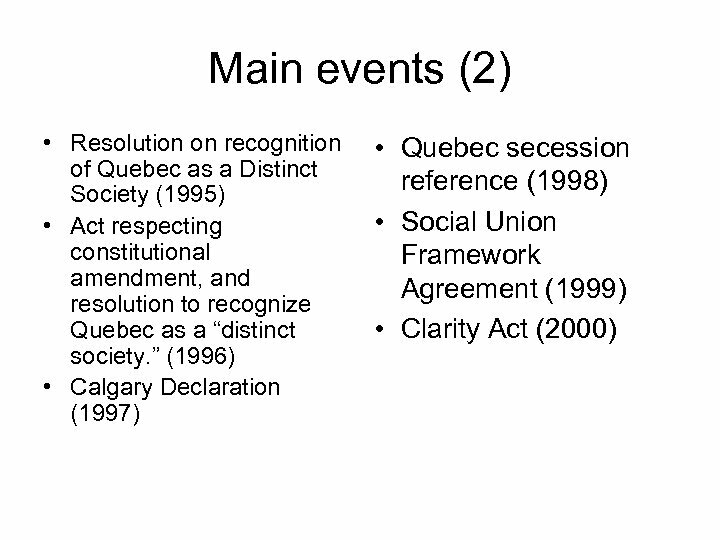 Under Can Const, can Québec secede unilaterally, without a constitutional amendment? – 2. 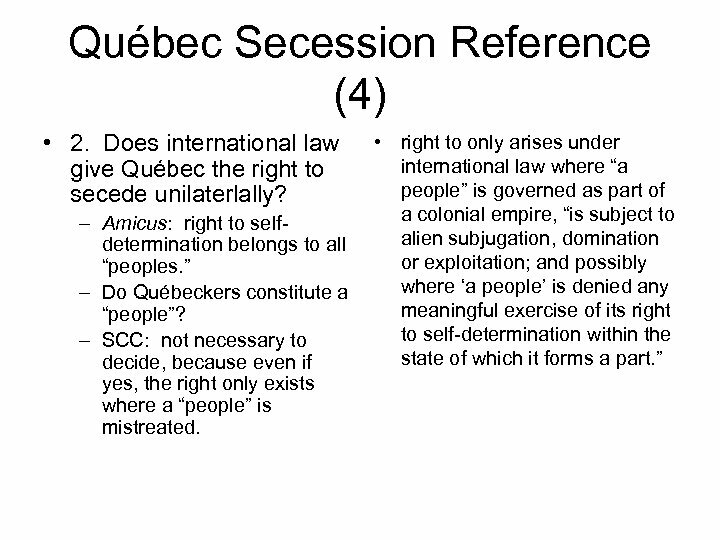 Under Int law, can Québec secede unilaterally? – 3. If conflict between (1) and (2), which takes precedence? • Why did SCC write such a lengthy judgment? • 1. Can Québec secede unilaterally under constitution? – Arguments in favour based on democracy. – What is democracy? – Our democracy is based on shared values, and unilateral secession puts these at risk. Thus, duty to negotiate. 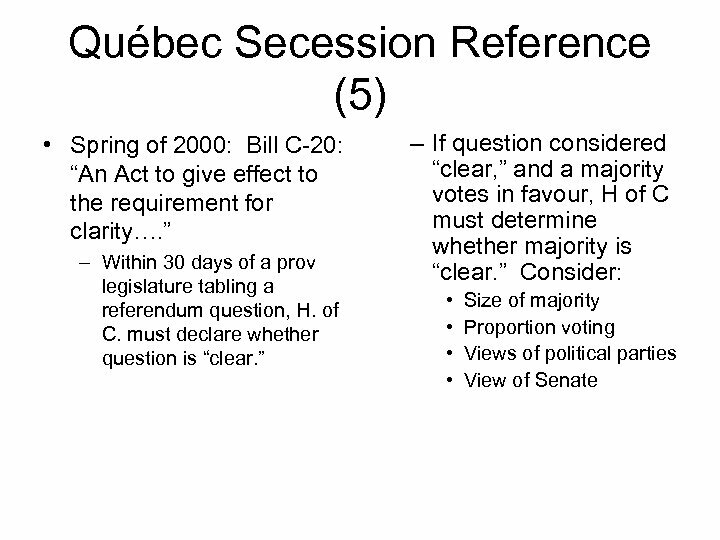 – Was SCC too activist, or not activist enough re “clear question” and “clear majority”? 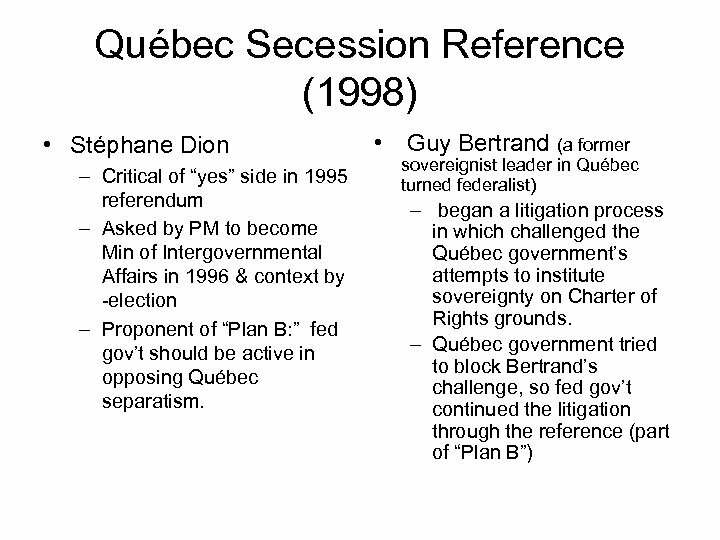 Québec Secession Reference (6) • After SCC decision: PQ gov’t seemed to support decision. 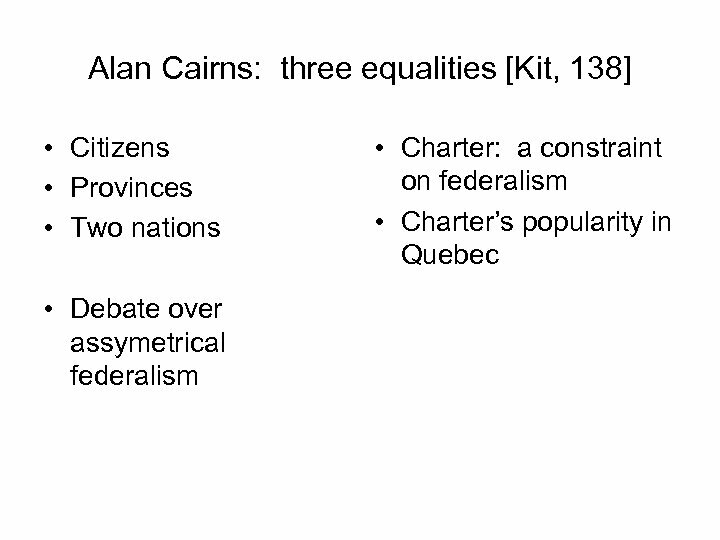 • Jacques-Yvan Morin (former Québec intergovernmental affairs minister): SCC decision means feds can’t refuse to negotiate, but can put up many obstacles to Quebec secession. • Kenneth Mc. Roberts: The Trudeau strategy for Canadian unity has failed. 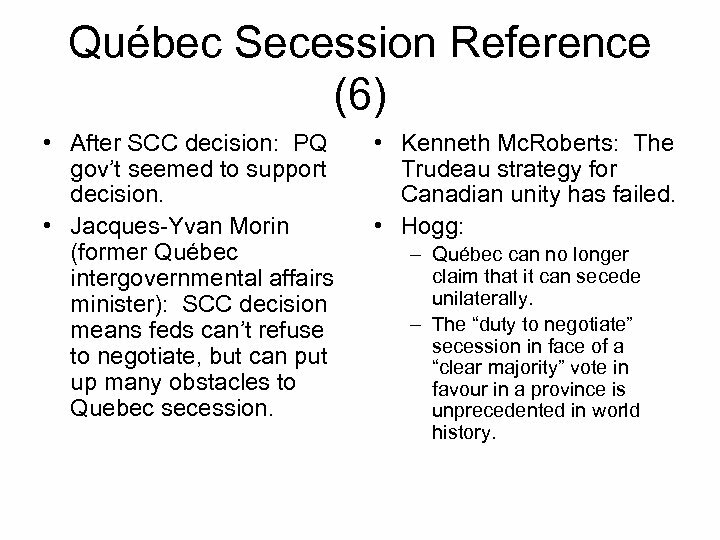 • Hogg: – Québec can no longer claim that it can secede unilaterally. – The “duty to negotiate” secession in face of a “clear majority” vote in favour in a province is unprecedented in world history. 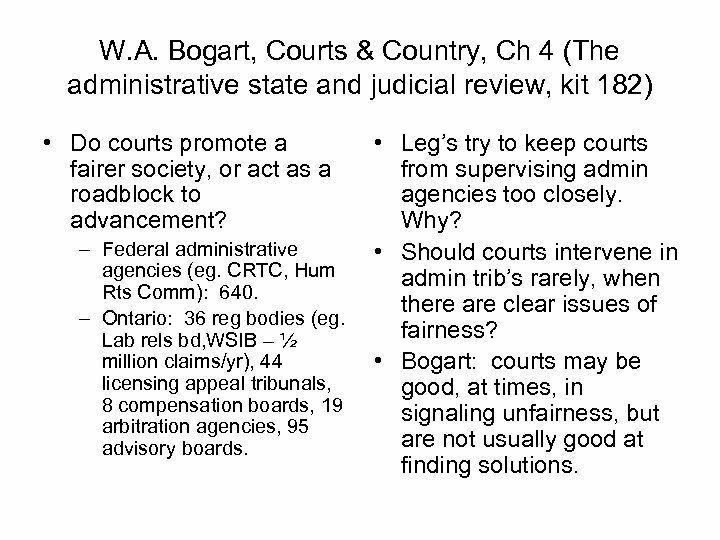 W. A. Bogart, Courts & Country, Ch 4 (The administrative state and judicial review, kit 182) • Do courts promote a fairer society, or act as a roadblock to advancement? – Federal administrative agencies (eg. CRTC, Hum Rts Comm): 640. 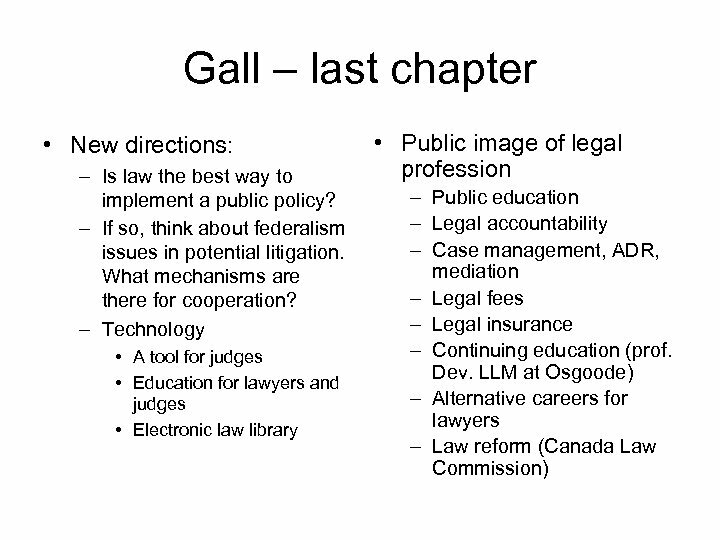 – Ontario: 36 reg bodies (eg. Lab rels bd, WSIB – ½ million claims/yr), 44 licensing appeal tribunals, 8 compensation boards, 19 arbitration agencies, 95 advisory boards. • Leg’s try to keep courts from supervising admin agencies too closely. Why? • Should courts intervene in admin trib’s rarely, when there are clear issues of fairness? • Bogart: courts may be good, at times, in signaling unfairness, but are not usually good at finding solutions. 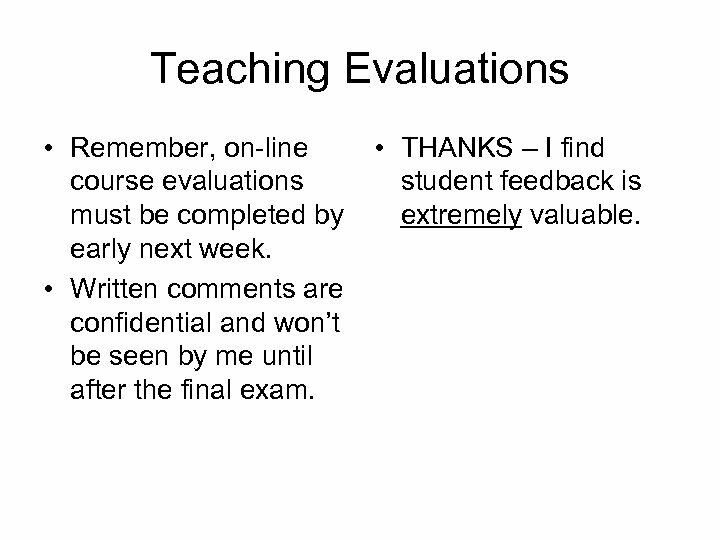 Teaching Evaluations • Remember, on-line course evaluations must be completed by early next week. 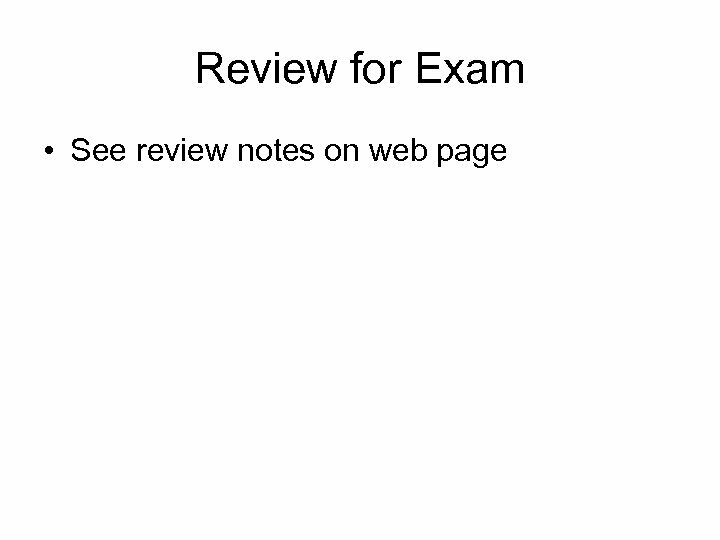 • Written comments are confidential and won’t be seen by me until after the final exam. • THANKS – I find student feedback is extremely valuable.